Why did you join Deutsche Bank? I studied Computer Engineering at the National University of Singapore. I’ve always been passionate about working at the crossroads of two disciplines, two industries, and the technology division of a global financial firm is just that. I was a DB tech intern in the Summer of 2014 and started on the grad programme in 2015. Since then I’ve been through several rotations in Global Transaction Banking (GTB), Corporate Tech, Information Security and Global Markets. I think what makes the culture so strong at Deutsche Bank is the real diversity of countries, cultures, and professional backgrounds. In technology we work across different time zones and interact with parallel teams all over the world. Every financial firm that operates in Asia has to deal with big differences in regulatory requirements between jurisdictions, and that’s one of the key challenges we have to address in technology. Heavy-handed, one-size-fits-all solutions are not an option; we have to tailor global standards to suit local demands. I don’t know that I’ve changed, but I’ve definitely come to realise my strengths and weaknesses. Having experienced several teams across the organisation, I’ve realised that I enjoy working with cutting-edge tech, and how lucky I am to be involved in some of the most exciting industry platforms. The programme has been a great way to form long-lasting connections and friendships. It’s amazing to meet and start working with hundreds of new colleagues who are just as keen to make an impact as you are, to ask questions, and to learn about the bank’s strategy from senior managers. I also got the chance to make several trips around the UK and explore London – a memorable experience. If you’re interested in working in a cross-disciplinary field, a bank is an excellent choice. 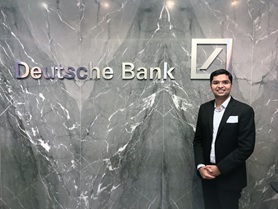 You develop products all the way from ideation to successful adoption, and at Deutsche Bank you work with innovation labs and technology centres around the globe. You’ll get the chance to take our digital presence to the next level – to innovate not only in the way we service our clients, but in how we as colleagues go about our work.